The NAPE Education Foundation’s STEM Equity Pipeline™ works with teams of high school and college partners to implement a data-driven decision-making program improvement process (the Program Improvement Process for Equity in STEM, PIPE-STEM™) focused on increasing the participation of women and girls in STEM-related programs of study at the high school and community college level. Since 2008 the STEM Equity Pipeline has been providing high-quality professional development, technical assistance, and consulting at the state and local level. Read about the project’s successes. Currently, 19 states have been involved in the national program (see list to right). The work of the project is carried out by four organizational units: a National Advisory Board, an Extension Services Group, State Teams, and Local Educators. Their activities are supported by a Virtual Learning Community, a web-based portal that houses project information and relevant resources for the STEM equity community and that provides a common “meeting place” for all project participants. Each month the Program issues its e-newsletter, the Pipeline Press, which highlights program events and news, news from Washington, DC, publications, resources, and STEM events of complementary organizations. Read the Pipeline Press for October 2017 issue of the Pipeline Press. Sign up to receive this free e-newsletter each month. Upcoming and archived webinars are also available. 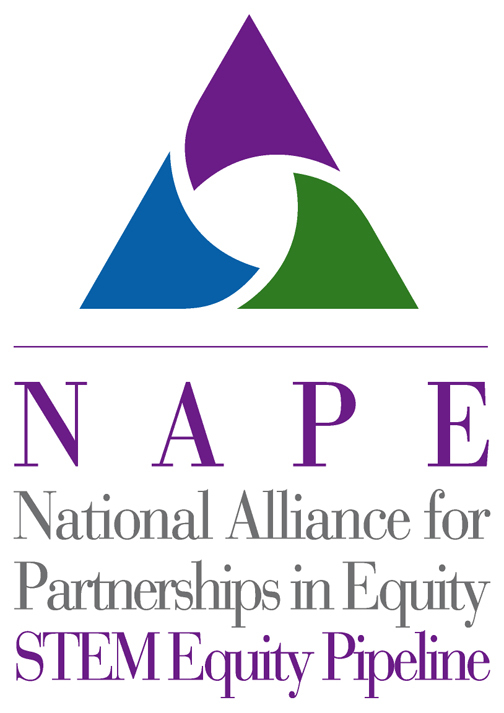 NAPE has developed a handout that lists STEM-related career clusters with associated pathways. In 2014, NAPE’s STEM Equity Pipeline professional development programs were included in Change the Equation’s STEMWorks, the source for high-quality STEM education programs.